The model is based on the System Dynamics approach and simulates the transport system in linkage with the economy, the environment and the energy systems. It is therefore capable to represent long term impacts of transport policies not only on mobility but also on wider aspects such as economic growth, greenhouse gas emissions or regional development. The model covers the EU28 countries plus Norway and Switzerland and simulates until the horizon of the year 2050. 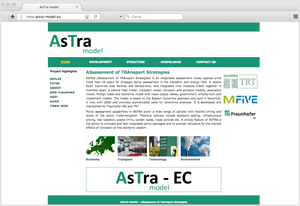 ASTRA is developed by Fraunhofer-ISI and TRT Trasporti e Territorio. Policy assessment capabilities in ASTRA cover a wide range of policies. 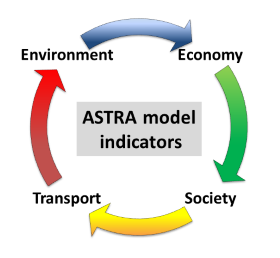 The indicators that ASTRA can produce cover a wide range of impacts; in particular transport system operation, economic, environmental and social indicators. A strong feature of ASTRA is the ability to simulate and test integrated policy packages and to provide indicators for the indirect effects of transport on the economic system, e.g. GDP growth or employment. A dedicated version of the ASTRA model (the ASTRA-EC model) have been developed for the European Commission. The tool is accessible through a dedicated user interface, in order to allow the Commission an autonomous use for assessing economic and social impacts of the European transport policy.